Tablets are almost perfect reading devices. They pack big, bright screens, plenty of reading apps as well as fast, wireless connectivity. This means that reading on them is never less than a pleasure, with support for multiple file formats and instant access to thousands of superb downloadable books whenever you're connected to the internet. We would even go so far as to say the Samsung GALAXY Note 8.0 is arguably the ultimate e-reader. With a more portable form than the 10-inch tabs on the scene and a lighter, thinner body, Samsung's pre-loaded reading software and support for the wealth of reading apps Android offers, it's got it all. Measuring just 7.95mm thick and weighing only 340g, the Samsung GALAXY Note 8.0 is a hand's best friend. After all, we all know avid readers spend hours on end with good books, so what good is a book replacement that can't be held for more than fifteen minutes without causing wrist-ache? Above and beyond being thin and light, the Note 8.0's ergonomic curves means that sharp angles won't dig into the hand. 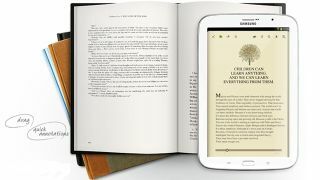 Plus, one final bibliophile bonus, Samsung's super-portable tablet will also fit virtually anywhere a Kindle or thin paperback might. So whether it's a handbag, outer compartment of a laptop bag or backpack, or even a glove box, the Note 8.0 will stow where 10.1-inch tablets simply won't. The WXGA screen on the Samsung GALAXY Note 8.0 is also perfect for reading. With LCD screen technology, it produces crisp, pure whites and plenty of detail. The 1280x800 resolution means its aspect ratio is slightly wider than 16:9 when held in portrait. This additional width more closely resembles a book than narrower tablets out there making for more words to a line and a far more comfortable reading experience. Finished off with fantastic viewing angles and punchy, vibrant colours, whether you're reading a book, a comic or a web page, the Note 8.0 will look sensational. Pull down the Note 8.0's notifications bar and you'll see a toggle to activate Reading mode, exclusive to the Note 8.0. Adjusting, colour, contrast and brightness, Reading mode works with certain apps to deliver the most comfortable reading experience you can expect from a tablet. It's worth jumping into the settings to see the apps Reading mode is compatible with. To do this, open the 'Display' sub menu within settings. You can also toggle reading mode off and on here. To pull up a list of compatible apps, just tap the text next to the toggle. Samsung's GALAXY Note 8.0 also comes loaded with a Samsung's own Learning Hub app, which, if you're in the mood for firing up those neurons will help you get your head around a range of subjects. With a number of free samples to choose from not to mention plenty of content you can buy, it's a great way to learn on the go. Samsung's hardware and software separate the GALAXY Note 8.0 from the rest of the Android pack in terms of reading supremacy, but Google's stock reading apps are also worth a mention – bolstering the Note 8.0's e-reading appeal. The most obvious Google reading app is Play Books. Connected to your Google account as with all the apps in this section, Play Books opens books downloaded through the Google Play Store. Google's collection of literature is growing fast with plenty of free and paid content already on board. You can browse for books either on your phone, or using a full web browser and enjoy your library on any Android device connected to your Google account or through a web browser. Google Play Magazines is one more app Google provides which turns your tablet into a bona fide library – this time, for slightly more frivolous reading.